In March, I finally got to see my name in print. I have a story in the book, Tales from the Grave: An Anthology of True Ghost Stories. This is a big turning point for me. I joined the New England Horror Writers last August. Since then, I have attended some of the events from time to time, but only as a spectator, never as a participant. I like the people who I have met so far in the NEHW, and I was really looking forward to the day I could hang out with them at one of these conventions or fairs. That day was finally here when I was published in that anthology of ghost stories. The story itself is called “Tucker’s Court” and it is about the house I grew up in, from the age of nine to twenty-five. My family moved in with my father’s parents when I was a kid, because their health was failing. Both of my grandparents died while I was living with them. There was always a presence in that house after that and many odd things happened to me. Maybe it wasn’t your typical horror movie kind of haunting, but to me it seemed worthy of a story. To my great pleasure, it was accepted by editor Rod Nojek and I made the transition from writer to author. Baby steps, first, you could say. Naturally after I got the word that the book was in paperback, I emailed NEHW’s Director of Publicity Jason Harris and got my name on the list for the next event, which was the 39th Heritage Craft Fair in Framingham, Massachusetts, on March 24. I had a couple weeks, so I thought I had plenty of time to get some books to sell at the fair. I placed my order with the publisher, only to be told that the books would not arrive in time. This was very disappointing and I immediately emailed Jason again, to let him know that my participation was in doubt. He told me to tell the publisher that I needed the books for an event and ask for rush delivery. I tried that, to no avail. The books were not going to arrive in time. Two days before the fair, I went online to see if there was any chance of getting a few books on time from Amazon. It turned out I could get them with the rush delivery option, if I ordered in the next forty minutes. As an added bonus, since the books sell for less than ten dollars, they were included in Amazon’s “Buy four books for the price of three” promotion. So I ordered four books and the website told me I could get free rush delivery if I was an Amazon Prime member. Free one month trial, it told me. What the heck, now I’m an Amazon Prime member, too. I was meaning to sign up for that anyway. Now, before I place d the order, it said that they were guaranteed to arrive by Friday. After I placed it, however, it said that they were estimated to arrive on Friday. Maybe it’s the English major in me, but there’s a big difference between guaranteed and estimated. A guarantee means that yes, it will be there, you can count on it. An estimate falls more into the, well; you’ve got a fifty-fifty shot. That’s not too bad, right? That made me nervous. My nerves were not calmed when 6 p.m. passed and the UPS truck failed to arrive. That truck drives down my street every night between 6 and 6:15 p.m. I checked the Amazon website and it said the package was out for delivery. What happened then? 7 p.m. passed and still, no package. I pretty much gave up at that point, figuring the driver somehow missed me. But, to my surprise, at 7:15 p.m. the UPS guy showed up on my doorstep with a package that contained the four books with my very first published story in them. Yes! 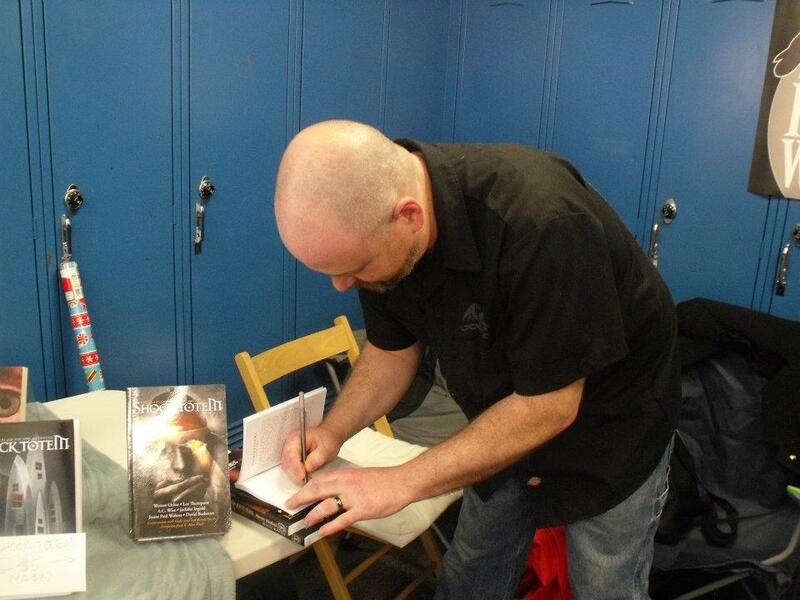 Author David Price signing first autograph. Photo by Pauline Price. I woke up the next morning and headed out to the fair with my wife, Pauline and my daughter, Kayleigh. Pauline probably won’t be able to come to many of these things with me, since she usually works on Saturdays, but we had a wedding to go to later that afternoon so she had the day off. After an hour or so drive, we got to the fair and Stacey Longo had a bookstand I could use to put my books on. I was so proud. It might sound silly, but every step towards my dream of a writing career is exciting, even the small ones. The Heritage Craft fair was held at the Keefe Technical School, in Framingham. That place is huge! I was expecting, I don’t know, a gymnasium maybe, but this was set up in a seemingly endless corridor. There was room for vendors on each side of the corridor to face each other, with a walkway for the patrons down the middle. The NEHW had its banner hung proudly at the site and I had a book for sale. How cool is that? The day was made even more enjoyable by the other NEHW members in attendance. These included, the aforementioned Stacey, Morven Westfield, K. Allen Wood and Rob Watts. Morven is, I assume, from Framingham, since her two books, Darksome Thirst and The Old Power Returns were set in Framingham. As the day went on, this became something of a running joke. My wife works in a retail store and she clearly had more experience with customers then the authors who attended. She did her best at greeting all the people walking by and managed to draw quite a few in by telling them that we had some horror stories available that were actually set in Framingham. This was great for Morven’s sales. It was an interesting day. We had some moderate interest at times and I managed to sell my first two books. When you sell at one of these events and the author is present, they want you to sign the book. Seems obvious, right? Well, I had the nerve-wracking experience of having to autograph my two books. My hands were shaking the whole time. It doesn’t seem like a big deal, I know, but it was to me. It was pretty cool. I also remembered that authors usually write some quick one liner that goes with the story. Since I have shadow people in my story I think I wrote something like “Watch out for the shadows!” If you were at the event and purchased one of my books, you should know those are the first two autographs I ever gave. Hold on to them, they’ll be worth something, some day. In addition to Morven’s plethora of sales, I believe Ken Wood, who is the publisher of Shock Totem magazine had a decent day in sales as well. Rob Watts was selling his book, Huldufolk, at the fair. It means “Hidden People” in Icelandic and he was even including a free CD that went along with it from The Traffic Lights, the band that is mentioned in the story. I picked up a copy of Rob’s book and one of Stacey’s anthologies before we had to leave for the wedding. It was a fun and slightly nerve-wracking day. It was a great experience. Any fledgling authors out there could do themselves a world of good joining an organization like the New England Horror Writers, which offers a great support system filled with amazing people. It also provides plenty of opportunities to sell your stuff at events including fairs and conventions. Join the NEHW now, you won’t be sorry. Thanks Armand. It is very cool. More to come! Working hard on that reality. Congratulations. I’ve signed a couple of the books I’m in for the first time recently…it’s quite a kick!